Under the layer of topsoil in your yard lies an intricate network of gas lines, water lines and tree roots. While your gas lines and water lines are not mobile and may only shift if the ground around them shifts, the tree roots are alive. They are growing and expanding on a daily basis, and eventually, this can cause significant issues for your home’s plumbing features. The Problem With Tree Growth Regardless of the age of your home, when it was constr ucted, care was likely made to lay the water pipes away from the roots of established trees. If trees were located too close to where the pipes needed to be laid, the trees likely were removed to prevent plumbing issues. However, tree roots grow and expand over time. Some tree roots are slow growing, and others can grow at a rapid pace. Even trees that were located far from your pipes can grow. 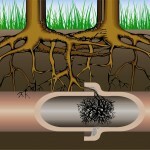 As they do, the roots can dig into pipes and cause leaks. They can also cause pipes to warp, bend and break through movement and pressure caused by their growth. In some cases, roots can wrap around and even crush mainlines and sewer lines to a home. What Can Be Done It can be difficult to prevent such damage from occurring in older homes where tree growth is established. When a house is built, preventive steps can be made to plant trees away from pipes. However, the roots will expand outward and may eventually reach those pipes. You may be able to work with an arborist to install products in your soil that can steer root growth away from pipes, and this often creates beneficial results. However, if you have recently become aware of a root-related issue with your home’s main water line or sewer line, you will need to call a professional plumbing service company for assistance repairing the pipes. 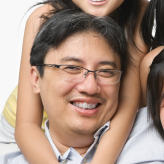 In some cases, an arborist may need to be called to correct root problems or even to remove the tree from the property. A plumber may be able to repair the main line or sewer line without digging into your yard in some cases. You can work with a plumbing company that uses special diagnostic devices like video imaging diagnostics to inspect the pipes from the inside. Depending on the type of damage that has been caused, a special procedure may be used to seal the pipe’s cracks or breaks from the inside of the pipe. In most cases, however, you will also need to work with an arborist to prevent future issues with your trees’ roots and your home’s pipes.